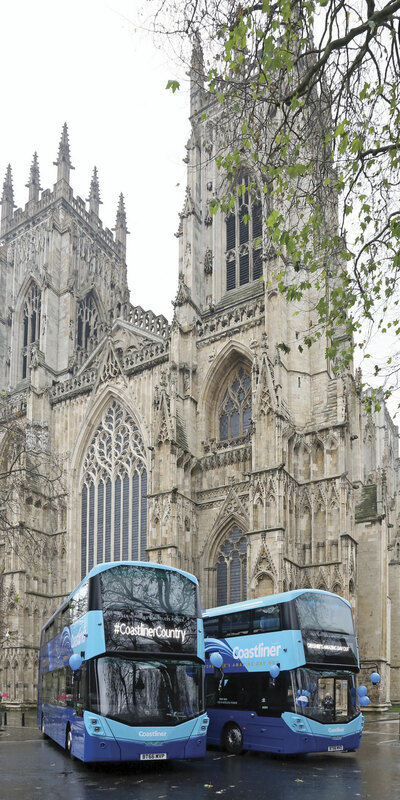 York’s iconic Minster provided an imposing backdrop to the launch of Transdev’s £2.34m investment in the Malton based Coastliner operation. Sparkling on a grey and damp afternoon were the first two of ten Volvo B5TL Wrightbus Gemini 3 vehicles in the new Coastliner livery, part of the branding package developed by Best Impressions to promote the routes as part of a new ‘Coastliner Country’ campaign. 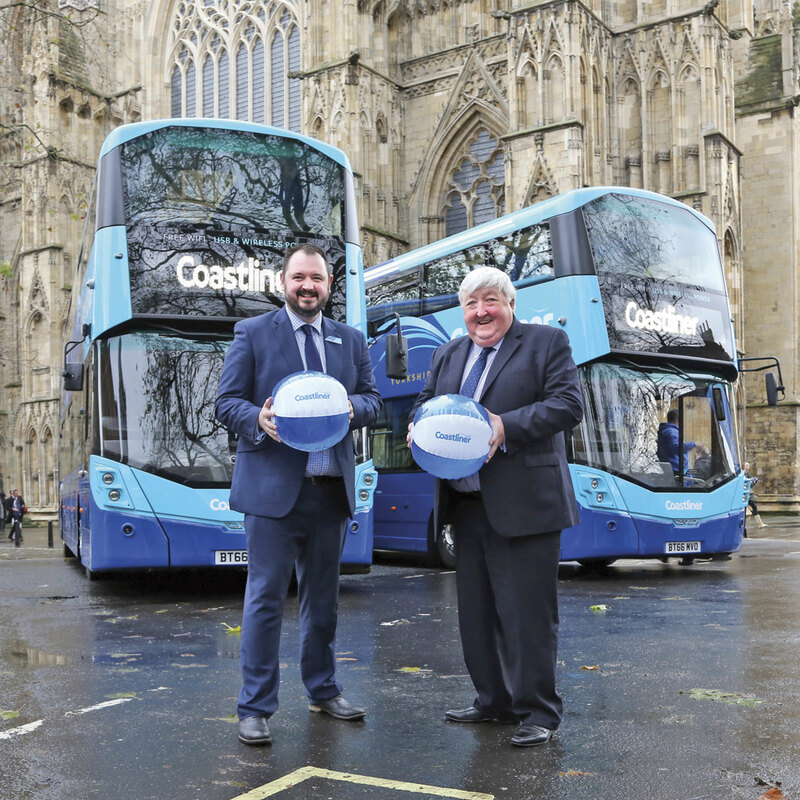 The quality concept for Coastliner builds on the success of the 36: Riding Redefined route between Ripon, Harrogate and Leeds relaunched earlier this year. Regular bus services linking West Yorkshire with the east coast can trace their development back to the days of the West Yorkshire Road Car Company, subsequently part of the National Bus Company. Following the latter’s privatisation in the late 1980s, the services passed to the AJS Group, later Blazefield Holdings and were invested in a dedicated subsidiary company, Yorkshire Coastliner, operating from Malton depot, in 1990. For many years, the length of the services operated placed them outside the limits of UK domestic operation, requiring the vehicles to be fitted with tachographs. Registration changes in 2015 removed this requirement and has resulted in improved flexibility of staff deployment. 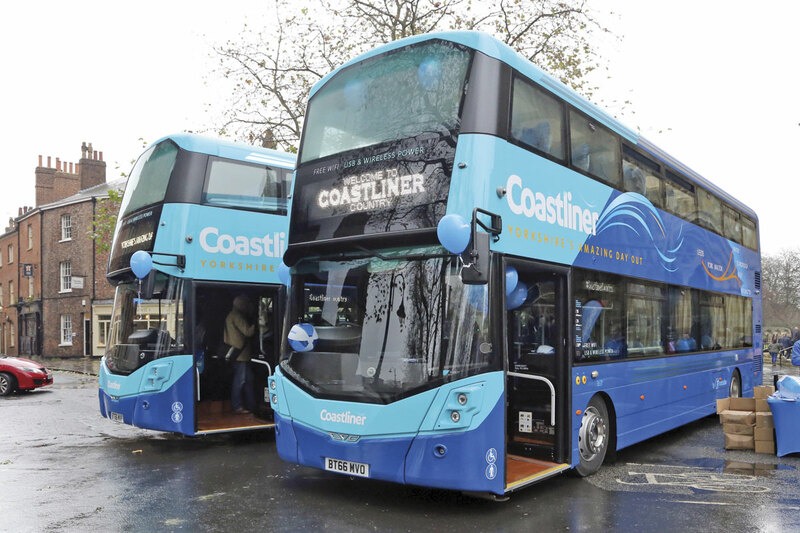 The new vehicles are the fifth generation for Coastliner and build on the brighter liveried vehicles introduced following the operation’s acquisition by Transdev in 2006. Their launch is accompanied by a comprehensive promotional package including a service booklet which includes not only timetables but also local maps, details of places of interest served and a short history of the Coastliner operation. The parallel CityZap express service from Leeds to York and Tadfaster, the York to Tadcaster express service are also included. The latter serves parts of Tadcaster not accessible to Coastliner following the destruction of the town’s bridge in the 2015 floods. The latest Coastliner timetable offers a core 30 minute frequency between Leeds, York and Malton. Alternate buses then continue to Scarborough and Thornton-le-Dale on an hourly basis, the latter continuing every two hours to Whitby. Additional journeys and connections at Malton link to Filey and Bridlington. The service is augmented during the summer holiday season. Coastliner is operated by Malton depot where 19 vehicles are based. 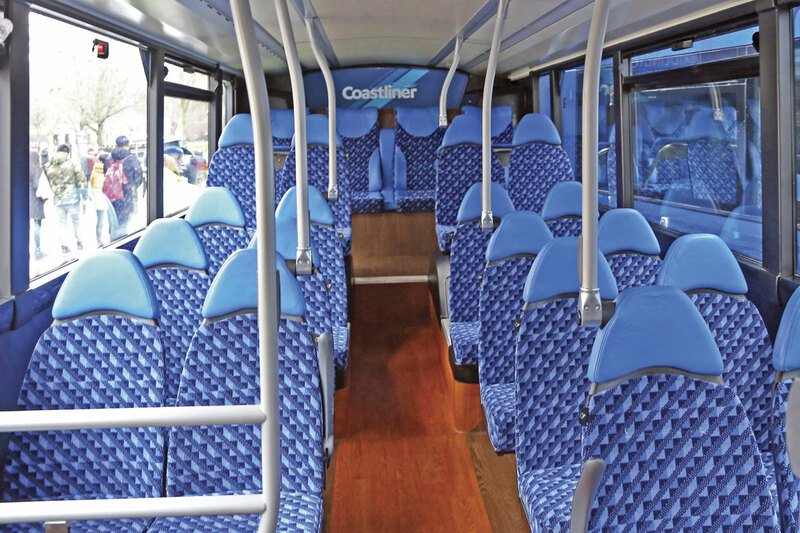 14 are required for Coastliner and the journeys that will normally be operated by the initial ten of the new higher specification vehicles are highlighted in the timetables. The vehicles’ technical specification, Wrightbus Gemini 3 bodies on long wheelbase Volvo B5TL Euro6 chassis, follows closely that of the vehicles introduced earlier in 2016 for the 36:Riding Redefined service. Referring to those vehicles, Alex confirmed ‘From a performance point of view, we are really happy with the vehicles on the 36, they are delivering around 8mpg on a demanding route. We know they are reliable too, so we are sure the new Coastliner vehicles will work straight out of the box.’ With longer distances between stops and a 616kg weight reduction compared with the vehicles they are replacing, even better fuel economy is expected from the new vehicles. 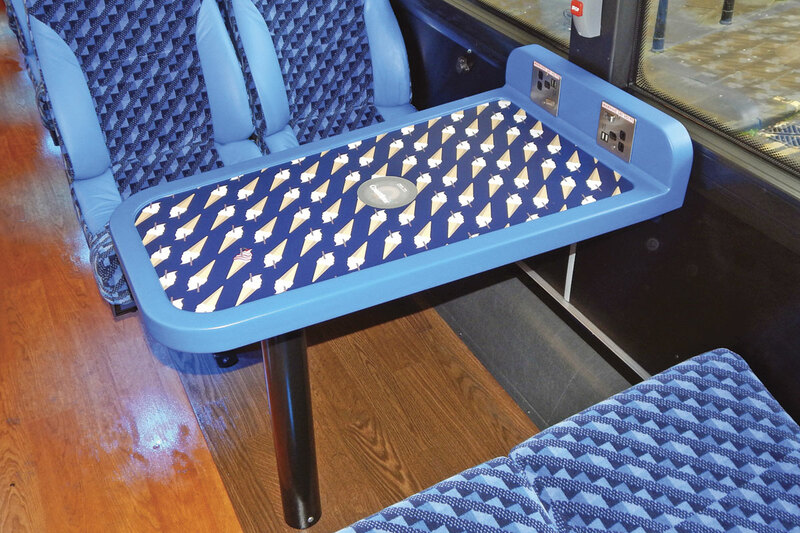 The interior specification includes two ‘power zones’ on the upper deck, with seats grouped around tables which are to a Transdev developed design for ease of access. These feature wireless mobile phone charging pads and plug-in charging sockets with integrated USB points. On the lower deck, Transdev’s ‘tech benches’ at the rear allow space to rest tablets, phones and laptops. USB power points and 4G Wi-Fi are available throughout. 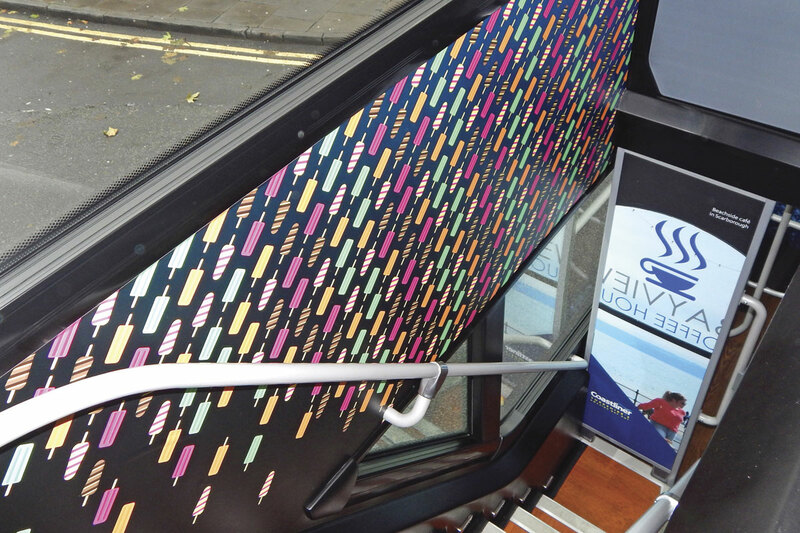 The upper deck has 41 Isri Ega coach seats trimmed in moquette with real leather headrest inserts. 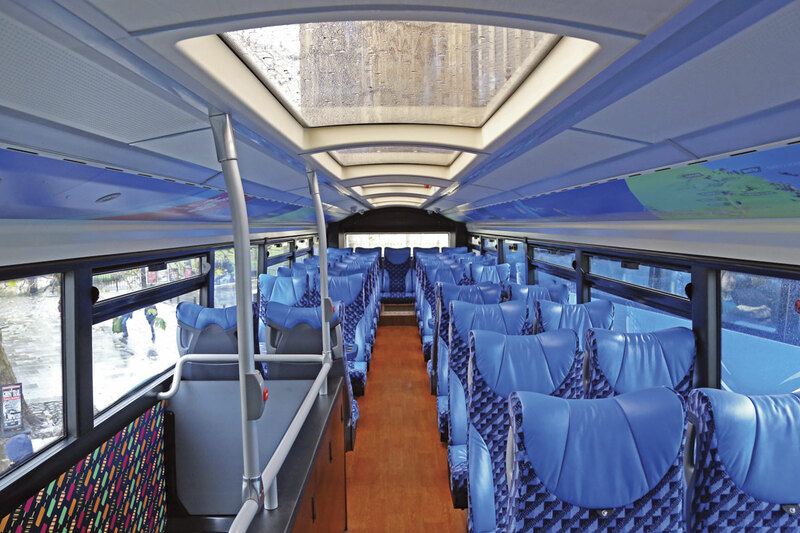 There are 18 similarly finished Isri Civic V3 seats on the lower deck with four wider spaced Ega coach seats across the rear and tip-ups in the front low floor area. A single wheelchair position is provided and small luggage racks provide a 90kg capacity. 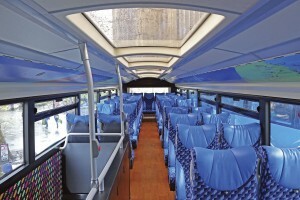 Total passenger capacity is 74 with a maximum of 69 seated. Wood effect flooring and LED lighting is installed throughout. Litter bins are incorporated in the design on both decks. 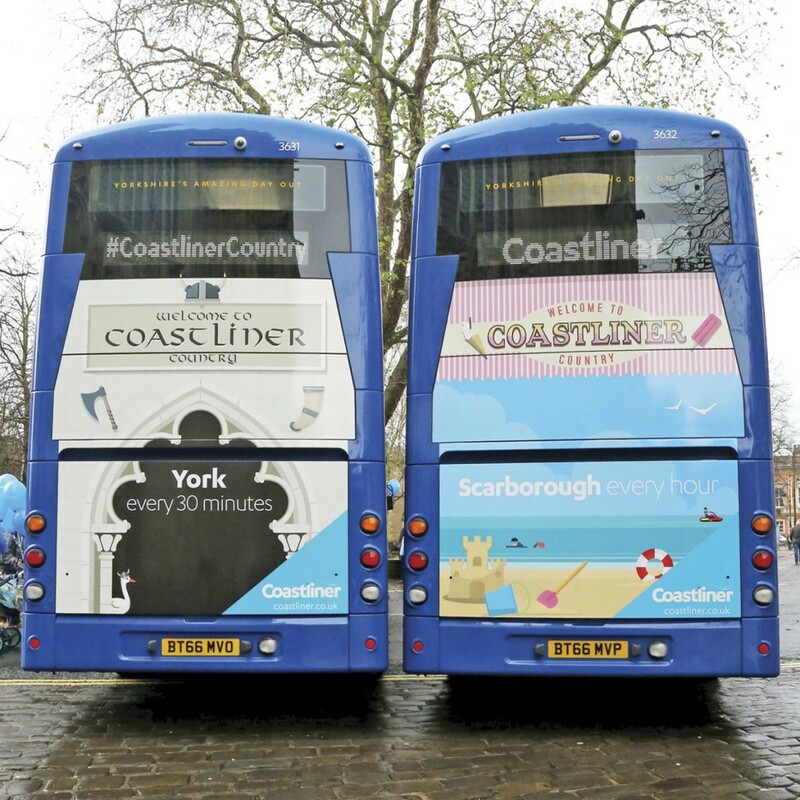 The livery on each bus is individually customised internally and externally with illustrations promoting destinations in Coastliner Country including Leeds, York, Malton, Whitby and Scarborough. 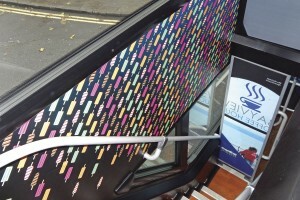 The inner staircase panels feature a variety of seaside inspired designs. Double glazed tinted windows are featured throughout including alongside the staircase and ‘skylight’ roof panels run the full length of the upper deck. 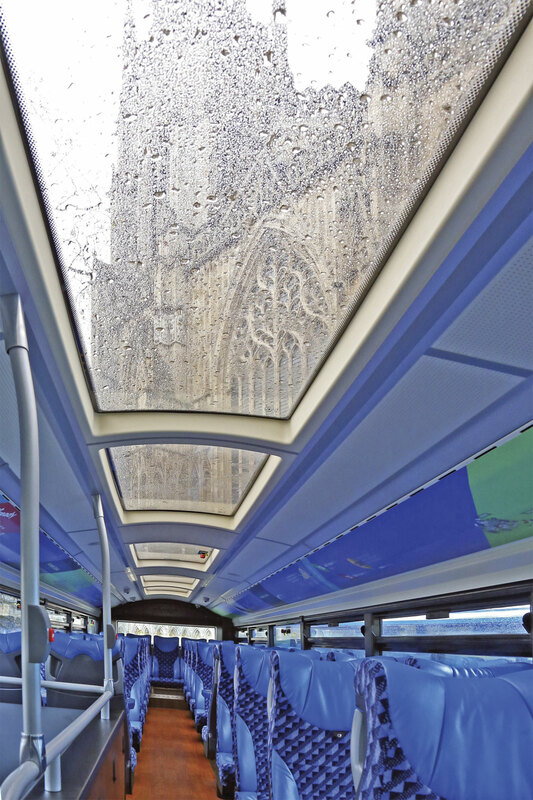 An emergency exit window derived from the Wrightbus new Routemaster is incorporated into one of the roof panels. High visibility destination screens feature Transdev’s ‘time to departure’ countdown at major calling points on the route. A 14 camera CCTV system is installed whilst scrolling interior screens and next stop audible announcements assist visually impaired customers. The first two new vehicles were due to enter service shortly after the launch with the full ten in service by early 2017. Transdev is currently out to tender for a further five vehicles to the same specification which will enable the full Coastliner schedule to be operated by higher standard vehicles later in 2017. Whilst investing in low emission Euro6 diesels for longer distance service, Transdev is committed to electrification of local operations through two significant projects. In 2017, five more modern low floor open top double-deckers will be acquired for the York City Tour, these will be converted to overnight charging battery electric operation by Magtec before entering service. By 2018, it is intended to convert the local services within Harrogate to full electric operation using the Volvo opportunity charging system. Eight new single deck vehicles will be required for this, charging at a number of pylons to be installed in the company’s Harrogate Bus Station. These will be of double-deck height as seen at Euro Bus Expo, offering both future proofing and no restriction on bay accessibility.